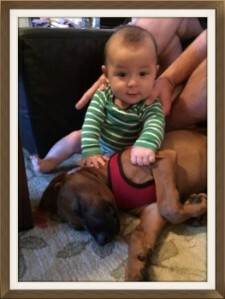 ​Ridgebacks are gentle, protective, and adoring of children. 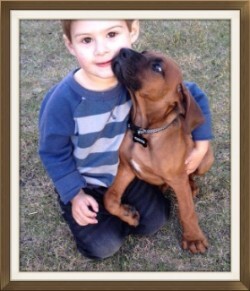 ​ Both children and the Ridgeback need to be taught how to respect each other and interact nicely. If a Ridgeback grows tired of a child’s games or wants to be left alone, he simply will remove himself from the room. ​ A young, energetic dog can unintentionally topple a small child, and needs to be taught to control his size and strength. Your dog will be as reserved when dealing with a strange child as with a strange adult. If he must take action he will be most gentle with the child (they have an emotional appreciation of the young and adjust their responses accordingly). If need be he will retreat from the path of the child, usually after a gruff exclamation! ​Ridgebacks insist on making themselves very much part of the family unit. They are companionable and inquisitive by nature, and like to be in close proximity to their people. While not intrusive, a Ridgeback can always be found wherever the action is. A bored or unhappy Ridgeback left to his own devices can a become destructive nuisance. Note: +There is no point in owning a Ridgeback if he is not considered a true member of the family with the same need for attention, activity, and companionship as his human counterparts. Ridgebacks quietly accept newcomers in their domain that they sense are friendly,but will keep a close eye on those they distrust. Ridgebacks usually act "standoffish" towards new people for the first few minutes after meeting them. He will watch, smell, and intuit the person before making up his mind whether or not the visitor is acceptable. 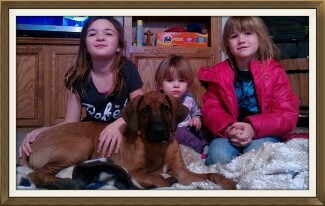 If the guest “passes” inspection Ridgebacks will gladly accept petting & attention. If the dog dislikes the visitor, he will clearly snub all friendly overtures and may keep a watchful eye on the guest. Your dog is an incredibly astute judge of character, and should the need arise, he will be there to do his “job” as protector as his ancestors have always done. The Rhodesian Ridgeback is one of the most intelligent of all dogs. A ridgeback is very quick to learn what you expect of him, and while he wants to please you, his stubborn streak sometimes gets in the way. Do not expect instant or unfailing obedience. I highly recommend obedience classes to all our puppy owners. His independence is a natural result of what he was bred to do. He is also "emotionally very sensitive", and he is not prepared to suffer the injustice of being mistreated. Life to him is a "survival exercise" and wasting his efforts on fruitless entertainment performances is not his forte. If there is something "valid to prove" your RR will do his best, dying for that proof if required. One must understand that the Ridgeback is powerful, even stronger than he looks. ​His muscles are clearly defined, but his ability to generate power far exceeds his appearance. ​Further he is possessed of very strong jaws which he can use, if ever the need arises, in a most effective manner. Consequently we strongly advise people against taking their Ridgeback to Attack Training. ​He will leap to your defense should the need arise.